Those kitchen cabinets…every time you open your kitchen cabinet doors to retrieve anything, the only thing you notice is the chipping paint, the outdated veneer or even the squeaky hinges. Whatever has you singing the old kitchen cabinet blues, a kitchen remodeling project could be the answer to your prayers. However, if you are considering a kitchen remodeling project, kitchen cabinets often eat up a large portion of your overall budget. In addition, there are often so many choices to make that this one decision can become overwhelming. You can easily get lost in a world of cabinet materials, colors, and designs. And while this can be often be an exciting turn of events, it can also present its own challenges. When choosing new kitchen cabinet doors it’s important to choose a style that won’t become quickly outdated, that fits the already established style of your home, will maintain their appeal, and will even appeal to others if you’re considering selling in a few years. Here are some ideas for choosing the best kitchen cabinet doors for you and your family. 1. Put together a budget and stick to it, you may even want to include a buffer for unexpected expenses. When totaling costs for your cabinets calculate the total cost as well as the labor if you don’t plan on installing them yourself. 2. Measure your cabinet area to get an idea of how much cabinetry is needed. Measure the length of each stretch of cabinet, the height and the depth. You will need exact measurements before putting in any orders and calculating general cost. 3. Decide between stock and custom cabinetry. Stock cabinets come in standard sizes with no modifications possible while custom cabinets allow for modifications but are more expensive. 4. Identify your style. Keep in mind the style that you’re going for as well as the style that you have already created throughout the rest of your home. You may want to browse magazines and websites to help give you ideas. 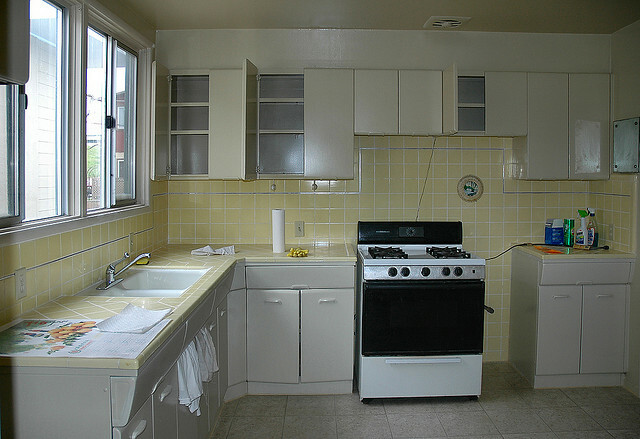 Along these lines, you’ll also need to decide between wood grain or painted cabinets. When it comes to wood cabinets you will then need to select the type of wood and color of stain. If you prefer painted cabinets, you will need to select the color of paint. 5. If you find cabinets that you like, inspect them for quality and durability if at all possible. 6. Consider cabinet refacing or refinishing kitchen cabinets. Both of these methods involve keeping your current cabinetry and merely refinishing them or refacing the doors and frames with a new veneer. This is an excellent way to achieve a new and fresh look without the cost of purchasing new cabinets. If you’re interested in refacing or refinishing current cabinets, call Summit Cabinet Coatings today! When undergoing a kitchen remodeling project there’s often a lot to think about but start by focusing on the cabinets and the rest will fall into place.